After a pretty hectic breakout at the end of last year, my skin has finally cleared and it was from the help of these following products. All of these were great at rehydrating my skin, helping with texture as well as combatting my breakout. I'll start by saying, I don't really agree that a scrub should be used daily. I tend to really only pick it up when I feel my skin really needs a good cleanse. I'd say this is pretty similar to most scrubs I've used in the past but this is just the one that I've been using over the past few months and found it really helps smooth out my skin (as well as having a great scent which is a nice bonus!). It creates a great base for applying foundation once I've put my moisturiser on. It's also really helped bring out the impurities in my face as well as helping reduce them over time. This is a scrub that isn't too abrasive but does get the job done. If I'm in need of a good staple scrub in the future, I'll be highly considering repurchasing this. This has been one more for my dry skin days- perfect for the current winter weather. It reminds me a great deal of the Liz Earle Cleanse & Polish; not just in its packaging, but the consistency of the product and how great it leaves my skin feeling after. What I sometimes find with products labelled "hydrating" is that they tend to break my skin out. However, this thankfully hasn't happened with this. Whether it's this or the combination of products I've been using, I'm unsure. But this is definitely a calming and soothing cleanser that I'm so happy I picked up. I bought this, along with the cleanser, in a set from HomeSense and, from looking at the full price, I got an absolute steal! I think this is one of the products I have to really thank for the way my skin has been feeling recently. It's feeling a lot more hydrated all day round as well as a little brighter. I'd be wary to pay the full price of this but after trying it, I definitely understand the higher price point. What's a skincare post without the mention of The Ordinary. I've already included this toner in my "EVENING SKINCARE ROUTINE" back last year. This is one I'll definitely be repurchasing. There was news that The Ordinary was shutting for business. however, that doesn't seem to be the case anymore. So, if you have problems with textured skin or hyper pigmentation, I'd definitely give this ago. Also, if you've been thinking of getting the Pixi Glow Tonic, I'd definitely try this one first as it's very similar in its properties and claims while being a fraction of the price and, I can vouch, that it's great. Whenever I've had big breakouts in the past I've panicked and used anything and everything I could to get rid of it. However, this time round I decided to draw things back, let the breakout run it's course with the help of these products and only use Tea Tree oil directly on the spots. I actually found this worked better than piling on treatments and creams as it was a more natural treatment for the blemishes. It also meant that, by just targeting certain areas, it didn't cause my whole face to dry out. This little oil of goodness is definitely something I'm going to be reaching for when I next breakout as well as just when I have a little pimple problem pop up in the future. 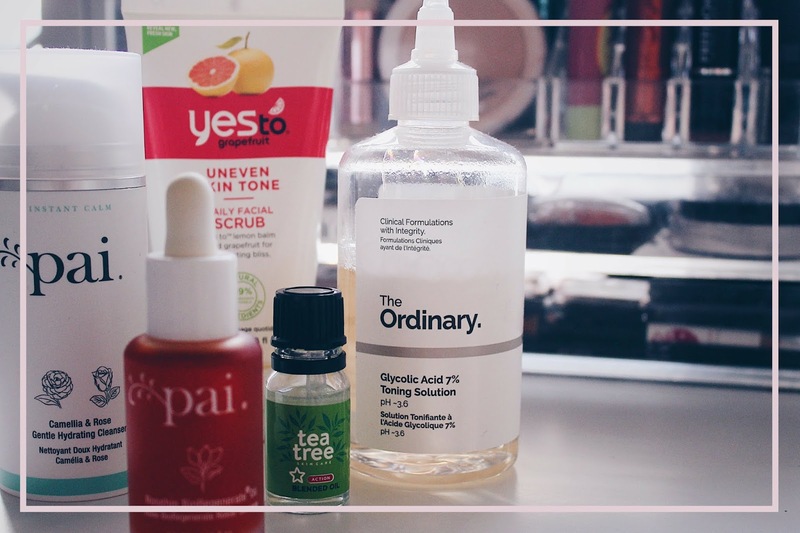 So there's a quick run down of the products that my skin and I have been loving lately. Have you tried any of these? Do you have any recommendations for texturised skin that I should try out?